Also, Tarand is a member of a very well known intellectual and political family (his father is Andres Tarand, former PM of Estonia, now member of the Social Democrats, and he has also served in the European Parliament before). His various cousins and aunts and uncles are rock-singers, poets, actors, scientists and so on. So perhaps not the best example of no-ties politics. He is a good example of running party-less and winning on personal charisma and both personal and family integrity. "Capitalism opened huge possibilities for the flexible and ambitious. And if you didn’t like it, you could always leave: millions of people tasted the difference with work and study abroad". And the neoliberal variant causing mass poverty,( never reported in "The New Cold War "-as there is No Alternative), families suffering the heartbreak of being ripped apart and the very right wing atavistic nation Mr Lucas often writes about. I apologise for using intemperate language with regards my total dissection of The New Cold War, it's propaganda mechanism, evasions of IMF and Western responsibility for the democidal effects of shock therpy. After all, talented people across Central Europe could leave impoverished lands anbd labour costs and inflation driven down in the UK's neoliberal debt driven bubble economy by importing masses of labourers. Yes, free travel was a boon. But to spin economic migration on the scale it has happened shows a contempt for ordinary people's lives in favour of that of the new global elite of the super rich. The Sainbury's who exploit the "motivation" of poorer people and displace British workers from jobs and could stimulate even more cut throat competition and resentment. Neoliberalism is dead. It crashed in 2008. The effects of the policies you have supported are in tatters as is the idea Georgia and other US clients will get into NATO in some seamless extension of the sphere of liberty and "freedom", a threadbare and discredited Whiggish progressive narrative. 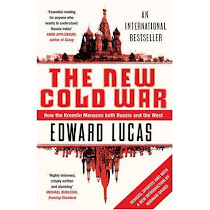 When, Mr Lucas are you going to address the reality of why people in Russia turned to Putin and how awful life was for Russians and ex-Soviet people under IMF shock therapists instead of gliding over it? I am dissecting you book forensically and will call on Norman Davies to reconsider his reasons for writing a foreword to your abysmal propaganda dressed up as history. There is no New Cold War. Just an revival of the Old Great Game.